When we told freelance recipe developer and food stylist Allison Kreitler we were all about summer party food right now, she knew just what to throw together. 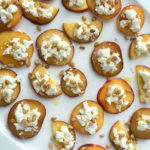 Her Seasonal Fruit with Goat Cheese, Pine Nuts, and Honey is exactly the simple summer app we were hoping for. Faith LOVES the combination. 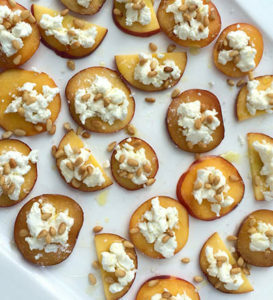 Right now, peaches and nectarine slices provide the “base” for all that good stuff. Allison suggested mango, zucchini, figs. Alex suggested trying it with watermelon. A month or two down the road, it’ll be apples and pears. What couldn’t we sub in for the “cracker” in this fun finger food? Use local honey if you can. Listen to this episode of The Faith Middleton Food Schmooze® for more summer party food ideas. We're calling these summer hors d'oeuvres, but we really encourage you to use whatever fruit is in season and make them all year round. The goat cheese, pine nut, and honey combo is one of Faith's all-time favorites. Whatever fruit you use is bound to look beautiful on a platter. Stand the fruit upright, and slice 1/8-inch thick rounds off opposite sides down to the pit or core. Discard the first outer slices that are mostly skin. Cut large rounds in half to make 24 slices of fruit. Arrange fruit on a serving plate or cutting board. Divide the goat cheese between the fruit pressing lightly so it adheres. Drizzle the honey and the olive oil over the goat cheese. Sprinkle with pine nuts and salt. You can also use firm but ripe figs or mango for this recipe. Cut 12 figs in half lengthwise and arrange skin down on serving platter. Peel the mango, place it on one narrow side and slice into rounds down to the pit. You can cut a little bit off the narrow side to make a base so is easier to slice into rounds. Try to cut rounds from the meatier side of the mango (the pit is usually flat-ish).